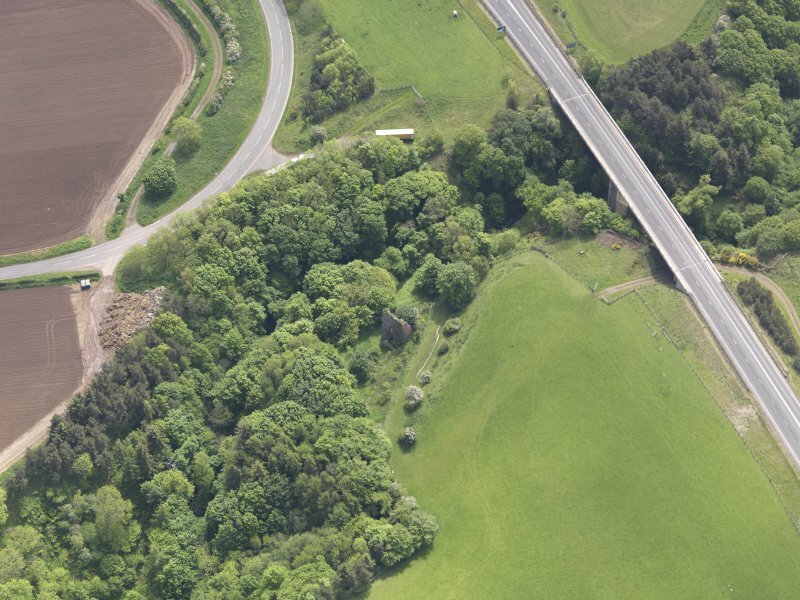 View of the remains of Cockburnspath Tower from SW.
Oblique aerial view of Cockburnspath Tower, taken from the W.
View of the remains of Cockburnspath Tower from S.
Oblique aerial view of Cockburnspath Tower, taken from the NE. 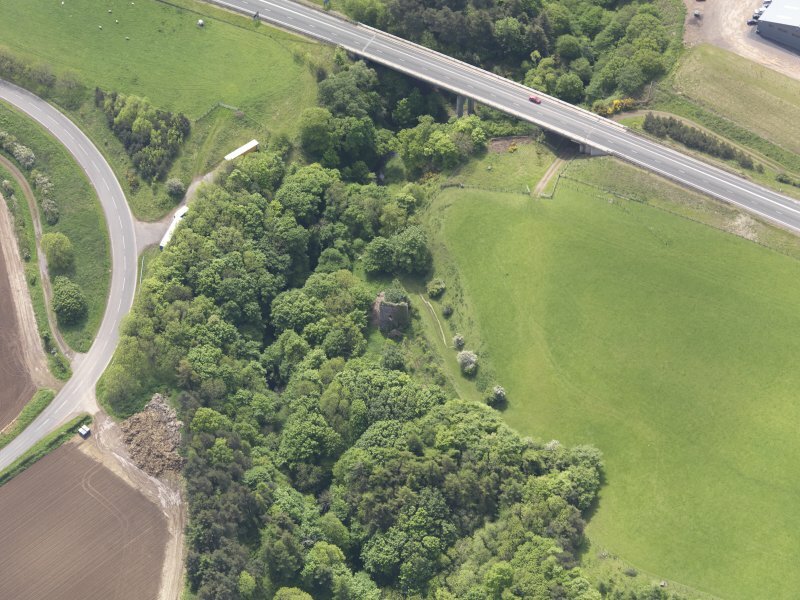 Oblique aerial view of Cockburnspath Tower, taken from the WSW. 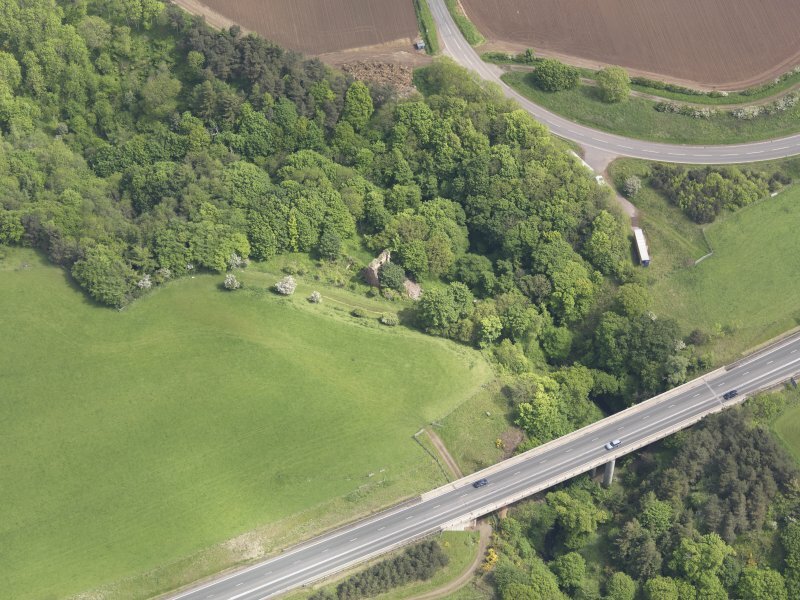 Oblique aerial view of Cockburnspath Tower, taken from the N.
Oblique aerial view of Cockburnspath Tower, taken from the SW.
Oblique aerial view of Cockburnspath Tower, taken from the SSE. 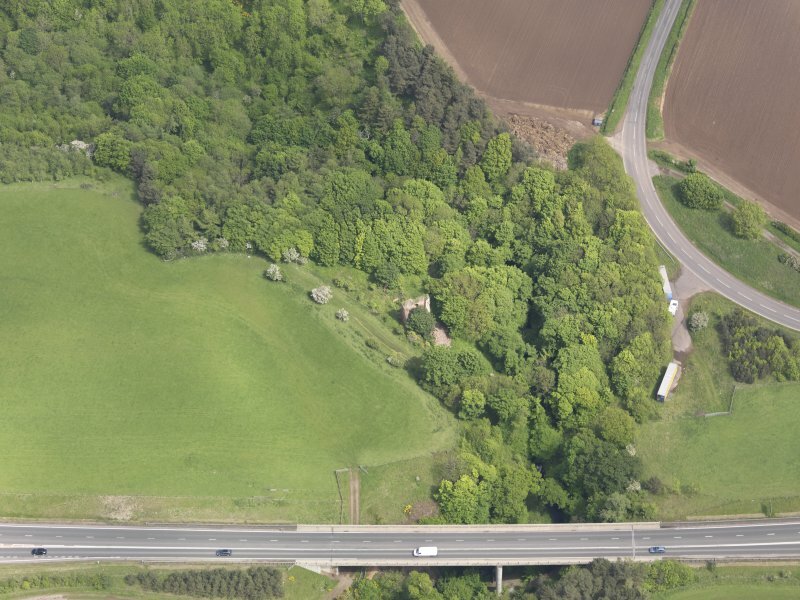 Oblique aerial view of Cockburnspath Tower, taken from the ENE. View from S. Scanned image of glass slide. 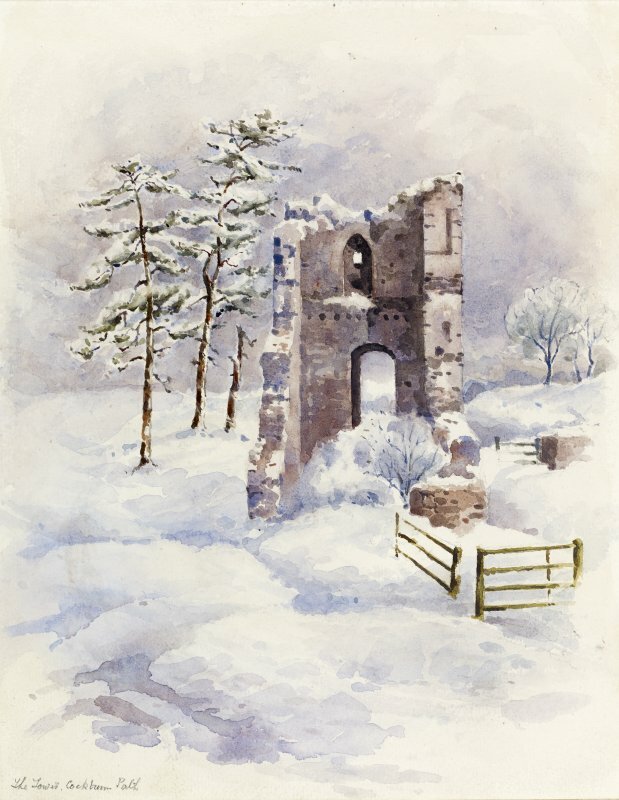 View of Cockburnspath Tower in snow. For clay whorl found at Cockburnspath Tower, see NT76NE 63. 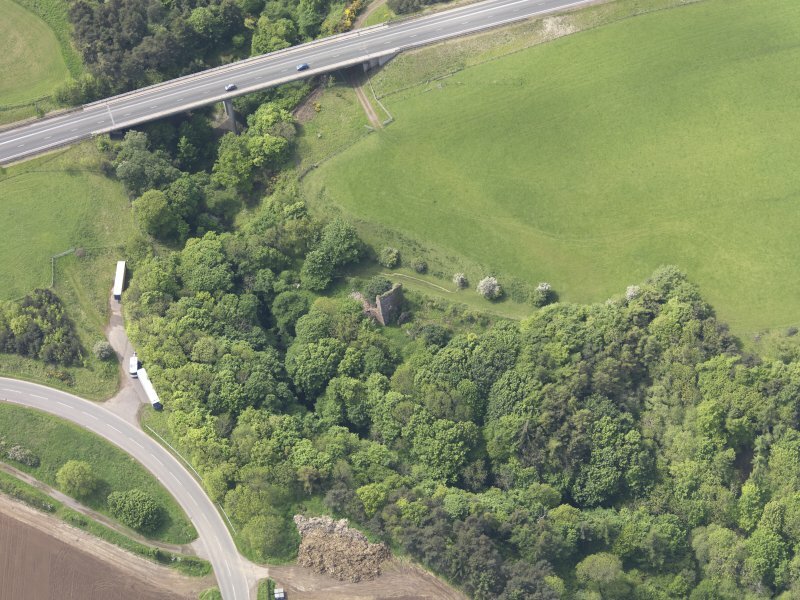 Cockburnspath Tower: On plan the main portion of the buildings has been in the form of a rectangular 15th century (D MacGibbon and T Ross 1889) keep situated at the NW angle of the site, measuring some 21ft by 18ft within walls averaging 6ft in thickness. 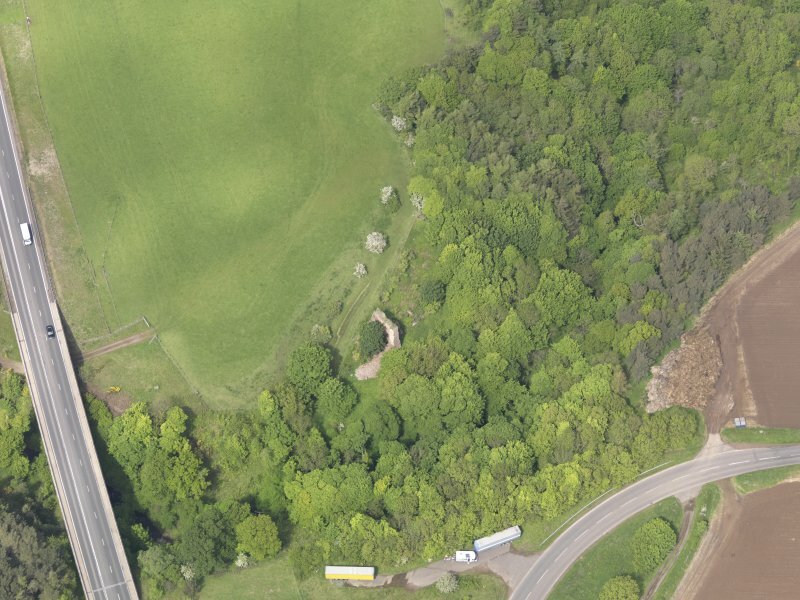 The SW wall remains to a height of only a few feet, and both the NW and SE walls are partially ruined. The NE wall remains some 40ft high, with indications of an opening at each floor level, arched on the interior and square-headed externally. Fragmentary indications of a vaulted basement remain. The doorway, in the NE wall is now built up; on either side of it the wall is strengthened by a buttress. 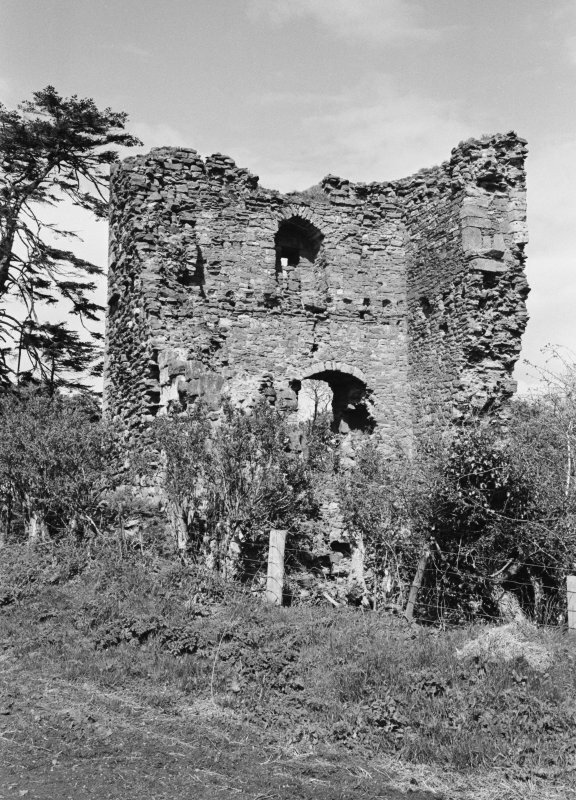 The upper portions of the walls are very ruinous, but it seems probable that there was originally a fourth floor and a parapet walk. 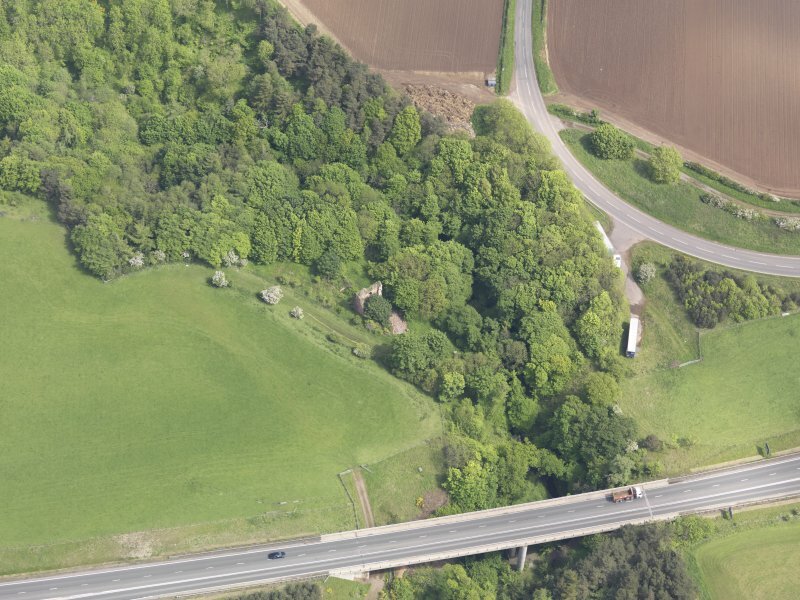 Some 12ft NE of the tower is a comparatively modern wing of one storey containing two apartments and measuring some 44ft by 19ft over walls 2ft in thickness. 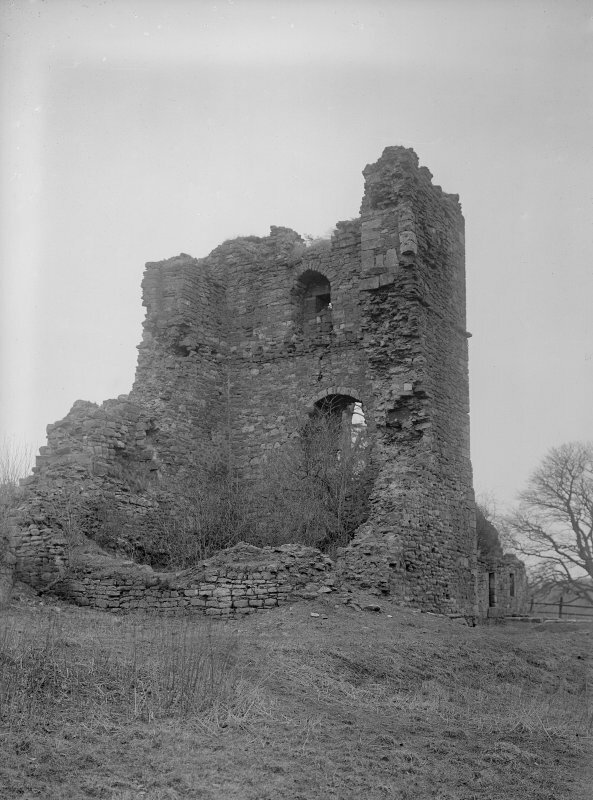 Another one-storeyed building, measuring about 70ft by 18ft within walls averaging 3 1/2ft in thickness, has enclosed a courtyard on the SE side, and no doubt served as the offices or stables in connection with the tower. It consists of three vaulted apartments with narrow loop- holes formed in the NE and SE walls. 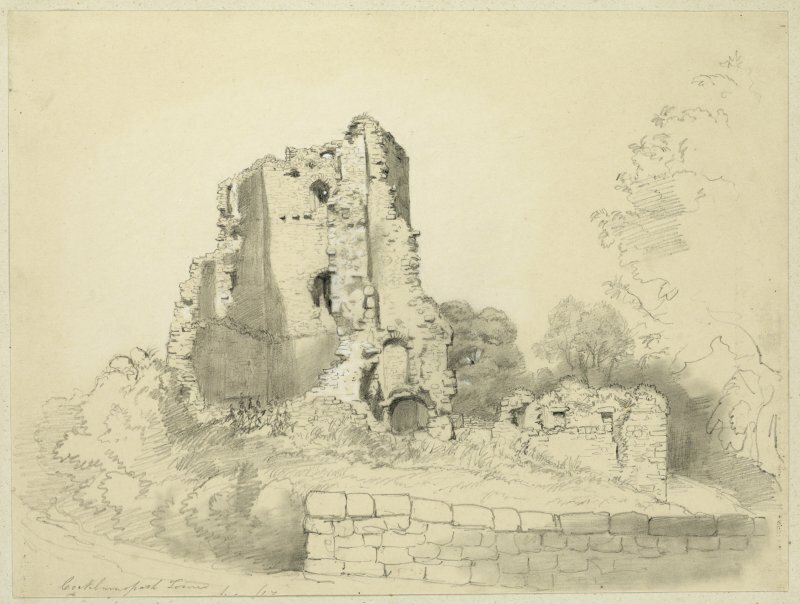 An arched ruined doorway (illustrated by MacGibbon and Ross, q.v.) which gave access to the NE apartment from the courtyard, was a good example of 17th century work. This doorway has been completely destroyed and only a few fragments lie scattered on the site. A A Carr 1836; A Thompson 1908; RCAHMS 1915, visited 1908. 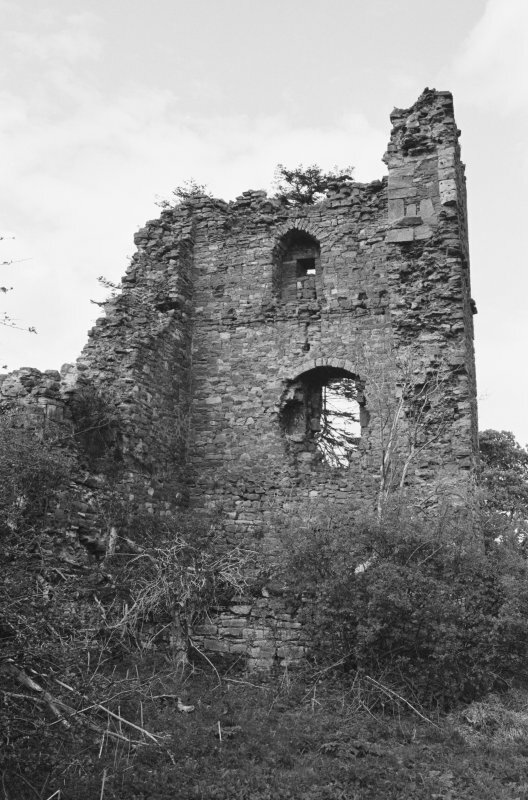 Cockburnspath Tower is generally as described; the N half of the tower remains to a height of some 25 to 30ft, the W and E walls are about 12ft and 4ft high respectively at their S extremities, the S wall having an average height height of some 4ft. The walls are in poor condition and thickly overgrown. (Visited by OS (JLD) 27 October 1954). Visited by OS (WDJ), 20 April 1966. 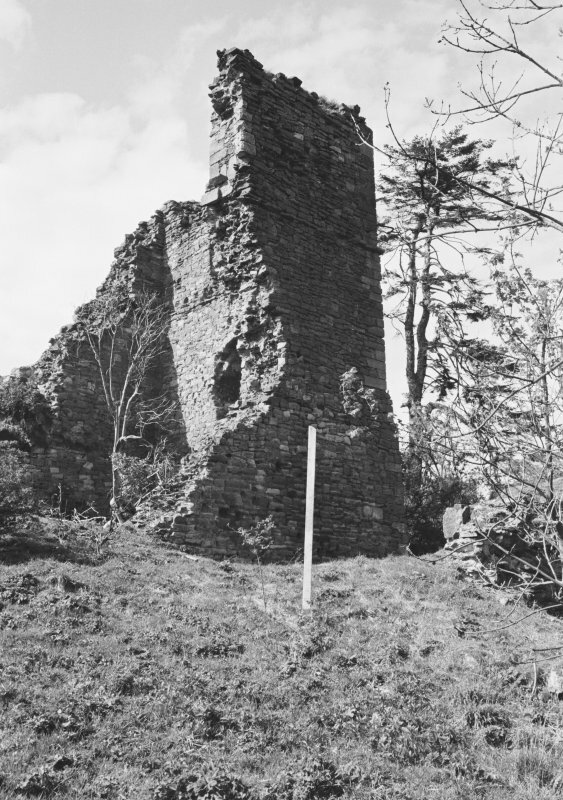 Photographs of Cockburnspath Tower, Berwickshire, by the Scottish National Buildings Record in June 1962.